Crates can become a safe haven for your puppy and a place where he can spend the night with his favorite toy at his side. They are also incredibly versatile and can be used to teach puppies how to behave around the house. 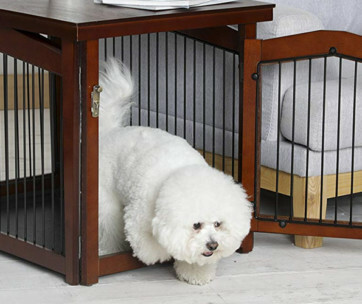 Buying the best dog crates on the market also make potty training a piece of cake once your puppy adapts to his new enclosure. Getting your puppy to fall in love with his crate is sometimes easier said than done. However, with the right training, your pooch can learn to use his crate and turn it into a positive space where he can unwind after a long afternoon at the park or after a stressful visit to the vet. This step is all about training your puppy to love his crate so the door must remain open at all times. Treats are also used to encourage your pooch to explore the interior of his new crate. All you need to do is hide some of those treats inside the crate and scatter a few more next to the door. Make sure that you plant those treats while your puppy is busy doing something else or while he is in another room. Give your pooch a chance to find the treats on his own and watch his curiosity take over as he explores his new crate. This process allows your puppy to build a positive connection between the crate and his doggie snacks and this will encourage him to enter the crate more often, especially if you keep those treats coming. You can also serve meals inside the crate so your puppy can get used to his new space. Always remember to keep the door open while your pooch is in there. If your puppy wants to spend time with you in the living room, then you can place the crate on the floor and sit down next to it. Quietly observe your pooch during this time and do not encourage him to sit in the crate. Choosing to lounge inside the crate needs to happen organically and without your interference. Once your puppy gets used to the idea of lounging in his new crate and munching on his treats, you can then proceed to the next step which involves shutting the door. Prior to shutting the door, you will have already prepared a stuffed Kong for your pooch to enjoy during his training. The Kong is a rubber toy with a hollow center that you can fill up with a cocktail of cheese, veggies and meat. Your pooch needs to be tired after a long day of physical activity in order for this to work. He also needs to enter the crate with an empty bladder. Toss the Kong in the crate and shut the door once your puppy follows the scent of food and enters his crate. Sit down next to the crate and make sure that your body touches the bars. Leaving the room is not an option as long as your puppy is still inside his crate. Your pooch should be busy eating his stuffed Kong while you keep him company. If he remains quiet and content, you can sprinkle more treats into the crate. Pay attention to the noises that your pup makes while he is inside the crate. If your pooch makes angry frustrated noises related to his treats, ignore them and refrain from giving him more food. Wait for him to settle down before rewarding him with his treats. Keep in mind that those noises are not coming from a place of panic or fear since you are sitting right next to the crate. Do not leave the room under any circumstances or you risk ruining his crate training. 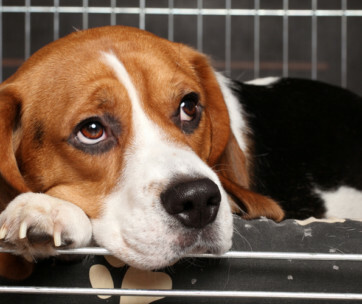 Leaving your pooch alone in his closed crate might trigger fear and panic in him and this will turn the crate into a negative space associated with you abandoning him. Knowing the difference between fear and frustration when it comes to you puppy will help steer this training ship in the right direction. They say slow and steady wins the race, so you need to apply the same concept to your crate training. This includes repeating the above step until your puppy is fully relaxed and content during his time inside the crate. It usually takes around a few days for puppies to get used to their new enclosure. However, not all puppies have positive experiences with crating, especially if they were once subjected to a traumatizing situation inside one. If this is the case then you need to proceed with caution and refrain from rushing your puppy. Move the puppy crate to your bedroom and place it next to your bed. This step involves shutting the door once your puppy is safely inside. Most puppies will feel secure as long as you keep them company during this stage. You can reach into the crate to sooth your pooch and pet him during the night. This will help calm him down and keep his anxiety at bay. Puppies are more accepting of this nocturnal crating routine because they tend to be sleepy and tired, so just because your puppy did not give you a hard time at night does not mean that it will be smooth sailing during the day. Practice is key, so make sure that you train your puppy mornings and evenings. Once your puppy is fully comfortable with the idea of being in the crate with you around, you can move on to the next phase. Make sure that you have your stuffed Kong ready before crating your pooch. Take him out to potty beforehand and then place him in the crate and shut the door. This time, instead of sitting right next to his crate, you can sit on the couch and watch television or work on your laptop. Reward your pooch with treats if he remains calm and avoid disturbing him if he falls asleep in the crate. Ignore any non-stress related noises and avoid feeding him continuously during his training. Your puppy needs to learn how to love his crate and relax inside it even in the absence of stuffed rubber toys and scrumptious treats. If your training is solely based on feeding your pooch, he will turn into a tantrum throwing mess when you extend his crating time and may not be able to tolerate his crate once his food disappears. Therefore, it is recommended to double check that your pooch is doing okay after finishing his Kong and treats before ending his crating session and letting him go. Food is merely a way to make his crate more enticing. Once your puppy is comfortable with the idea of being in the crate without you sitting next to him, you can then move to the next room while keeping the doors open. Start out with a nearby room and remember to make enough noise in order to let him know that you are still home. The last thing you want is for him to panic or feel abandoned during his training. You can sing or talk in a loud voice so he can hear you as you gradually move farther away from him. Your dog needs to be comfortable with this change in distance. Tone down your singing and opt for more silent activities such as reading once your puppy is settled in his crate. Do not forget to check on him from time to time to monitor his progress. The more comfortable he is the better. This training process will help showcase the importance of having a crate in the house, especially during busy mornings when supervising your puppy becomes a challenge. The peace of mind that comes from knowing that your pooch is safe inside his crate while you shower or prepare dinner is priceless. Crates also prevent your curious pup from getting in trouble or hurting himself in your absence. The time has come for you to leave your puppy alone for the first time and this is where your crate can come in handy. 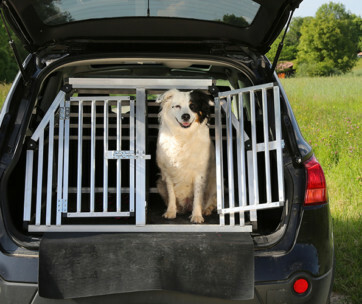 Choosing the best dog crate for your puppy will help make this process even more easy. Home alone training involves using the Kong and making sure that your puppy uses the toilet beforehand. Put your puppy in his crate and do all the things that you normally do before leaving the house like putting on your coat and grabbing your car keys. Let your pooch know that you are leaving. You can use simple expressions such as ‘goodbye’ or ‘see you soon’ before you walk out the door. Walk back in immediately without glancing at your puppy and pretend to go out a couple more times. Remember to use your trademark goodbye phrase every single time. Keep repeating this step until your puppy loses interest in your mundane activity and becomes more engrossed in his stuffed toy. He might even doze off while you play pretend and this is exactly what you want him to do. The goal is to have a relaxed puppy on your hands and not an anxious dog who is scared of being left along in his crate. Now leave and stand outside for five seconds before walking back in again. Repeat this step a few more times until your puppy is relaxed and content inside his crate. Go out again and wait for ten seconds instead of five. Repeat the same step over and over again and spend more time outside the house until your puppy gets used to the idea of you leaving while he is still in his crate. It takes around one or two sessions to complete this training but at the end of the day, not all puppies will feel the same way about their owner leaving the house. Borderline anxious puppies will need more time and patience as well as daily sessions. Taking a step back to assess your puppy’s progress and comfort level during this training is a prerequisite for its success. The next step involves leaving the house for a full five minutes. Simply walk away from your front door and then come back in. Repeat this step until your puppy is fully relaxed. If you have more time on your hands during the weekend, you can proceed to leave the house for ten to fifteen minutes. Take advantage of this time to buy some groceries or go for a short walk around the neighborhood. The more sessions you are able to squeeze in during the day the better. Keep in mind that those first fifteen minutes are usually the hardest for your puppy. Separation anxiety can be triggered during this phase of crate training so you need to be cautious and more observant when it comes to your puppy and his body language. If you are able to successfully reach this milestone, then you will be able to leave your puppy in his crate for this maximum amount of time each day. Gradually increase his crating time from fifteen to thirty minutes and then feel free to leave him in there for three hours if possible. Keep in mind that puppies under six months should only be kept in their crate for three to four hours tops, while adults can spend up to six hours in their crate, so age matters here. Maintain a regular crating schedule and make sure that you do not exceed those four hours at least until your puppy grows up and becomes more confident and independent in your absence. Make sure someone else is in charge of his crate time if you need to travel for work. Finally, do not use the crate to punish your puppy and make sure that you can tell the difference between a whine for attention and a whine to go to the bathroom so you do not end up reinforcing bad behavior. Take advantage of this training to bond with your new puppy and most importantly, have fun!